Industrial & Scientific supplying a comprehensive range of work protection optimal choice to provide full head to toe a good set-up in the workplace. 5" Long Chain Nose Pliers with 13/16" Side Cutter Jaw capabilities will certainly be a good safeguard to you, and a welcoming solution for your bargain. Xcelite  protection, breakthrough technologies, work faster to adapt changing a great. Wide collection of rely on portable instruments and safety accessories can take you places. With our charming items we provide value for money and enjoyable shopping. We offer choice of items, that are ready to be delivered to your doorstep. Find a piece that will make you happy every time you look at it. It's always entertaining to shop here at Neobits, because we offer a stunning products that can match any taste. Find a huge variety of similar well designed products bellow. If you have any questions, don't hesitate to contact our Customer Service department, after all, they are here for you. For a large variety and more related pieces, please visit other sub-categories for anything you need. 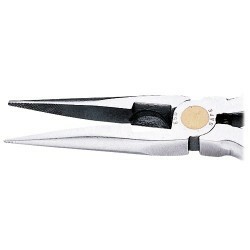 Proto - J229-01G - Needle Nose Pliers, Jaw Length: 1-11/16", Jaw Width: 1/2", Jaw Bend: 0°, Tip Width: 9/32"